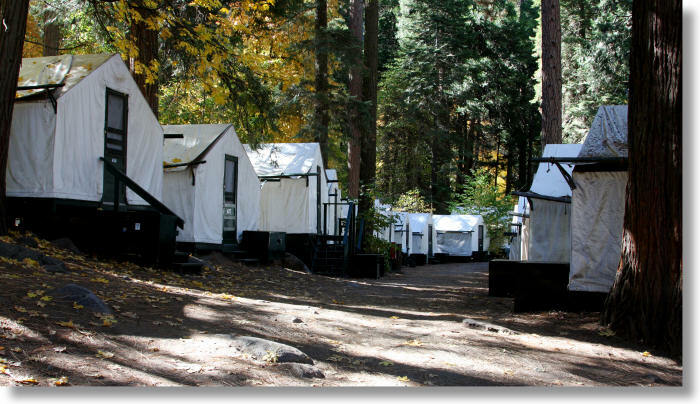 Curry Village (temporarily known as "Half Dome Village" due to a trademark dispute) has a few conventional hotel rooms (18, to be precise), but is best known for its endless rows of cabins and tent cabins - 60 of the former and 319 of the latter. It's located in the southeast end of Yosemite Valley, near the Mist Trail/Half Dome trailheads and just across from Stoneman Meadow. It's also where you go to rent bicycles or to rent rafts for lazy floats down the Merced River, and it's home to Yosemite's fabulously scenic ice skating rink. The rink, incidentally, is located at Curry Village because it only gets about 45 minutes a day of direct sun in the winter, thanks to its location near the valley's southern wall. If you're not a vast sheet of ice yourself, staying at Curry Village in the winter might not be for you. Try the Ahwahnee Hotel or Yosemite Lodge instead - both of these are closer to the north end of the valley. Cabins with Bath: Around $230 per night. These cabins have full bathrooms and electric heaters, and come with either one or two double beds. Cabins without Bath: Around $170 per night. These have propane heaters and two double beds apiece. Extra adults are $13 apiece. As with the tent cabins, you'll have to go outside and walk to community bathrooms and showers. Tent Cabins: Around $140/night, sometimes more for heated units. These contraptions (pictured above) have wooden floors and frames, but canvas walls. Configurations include 1 double or 2 single beds; 1 double and 1 single bed; and 1 double plus 3 single beds. (Note that what Curry Village calls a bed, most of us would describe as a cot with a mattress.) Heated tents have a maximum occupancy of four. The tent cabins each have a single electric light, but you'll probably want to bring additional lamps if you're a reader. Tent cabins don't have private bathrooms. Standard Hotel Rooms: Around $260 per night. These are in the Stoneman House, just across from the main office. These rooms all have full baths. Configurations include a single double bed; two double beds; and two double beds plus a loft with an additional double bed. Cabin 819: This one-of-a-kind cabin (for Curry Village) has a living room with a sofa bed, a separate bedroom with a king-size bed, and a full bath. It also has a television (just what you came to Yosemite for! ), a daily supply of firewood, and, thoughtfully, a fireplace to put it in. It was $290 per night the last time it turned up in the reservation pages at the official website, but I haven't found it there lately, so it might no longer be available. Shopping and Dining: Curry Village has a general store, where you can get your fix of candy bars and refrigerator magnets, and a surprisingly well equipped outdoor store. If you need a harness for the Half Dome cables or a high-tech rain shell, you can find it here. Dining options include a buffet, a pizza parlor, a tacqueria, and an ice cream shop.